This paper was presented at the Alfred Hitchcock conference For the Love of Fear convened by the Museum of Contemporary Art, Sydney, held from 31 March to 2 April 2000. I’m full of fears and I do my best to avoid difficulties and any kind of complications. I like everything around me to be clear as crystal and completely calm. I don’t want clouds overhead. I get a feeling of inner peace from a well-organised desk. When I take a bath, I put everything neatly back in place. You wouldn’t even know I’d been in the bathroom. The cinema is an abattoir. The shower scene from Psycho (1960) almost certainly qualifies as the most referenced and parodied in the history of cinema. It has been alluded to in countless slasher films, recreated as a line drawing in The Simpsons, revisited at the beginning of this year’s Academy Awards. As a whole, the film has been slowed down to a crawling pace to create award winning art and inexplicably re-shot in colour, frame by frame – with a cow or two thrown in for good measure – to produce a Hollywood flop. The scene also remains one of the most critically saturated in the history of film studies. Each frame has surely been scrutinised from as many angles, by as many different film theorists, as were cut into the scene itself. Inevitably, the very business of endlessly producing ‘close readings’ of Psycho has itself been dissected by David Bordwell in the hope of exposing the worn-out assumptions of scholarly film interpretation. Such a meta-critical move was, of course, never going to bring the game to a close. Recently published readings of Psycho (once again) discern unmistakable traces of vicious homophobia, while others (once again) celebrate Hitchcock’s provocative exploration of repressed bisexuality. And it is hardly likely to stop there: a meticulous shot-by-shot breakdown of the scene now exists on the internet, rendering access to the mechanics of microscopic Psycho-analysis a universally and instantly available right. In this paper I hope to take the art of Psycho-analysis through one more twist. It is my desire here neither to dispel nor to expose the fascination which the film continues to exert upon cinema-goers, movie-makers, feminists, and scholars of film around the world, but to take the evident charisma of Psycho seriously and follow it to the limit. Unashamedly and without reservation, I construct Psycho as a whole – and the shower scene in particular – as if it provided a unique demonstration of the power of film in general, indeed, as if it constituted the exemplary exception in the history of popular film. There is, of course, nothing original in treating Hitchcock’s oeuvre as a special limit case in the history of classical film form, nor in considering Psycho as an extreme and telling moment in the development of Hitchcock’s at once utterly inimitable, yet somehow exemplary approach to popular film making. With the shocking killing off of its main protagonist in mid flight, as critics have often remarked, the narrative of Psycho seems to break itself in two, as if risking itself at the very limit of those ‘conventions’ which guarantee the continuous flow of classical film – a flow invariably composed, as we all know, of so many cuts. Several theorists (Bellour, Mulvey, Deleuze, Zizek, Modleski …) have already placed Hitchcock’s films in general – and often Psycho in particular – in the strange and enticing position of simultaneously epitomising and disturbing, completing and undermining, enacting and exposing, the defining norms of commercial film practice (in whatever formal, political, and historical terms these may be contextualised for the purposes of each analysis). It is precisely the question of the nature and effects of this flow of cuts which is at stake here. It is my claim that the characteristic methods Hitchcock employs to cut the flow in Psycho at once exemplify the cinematic principles which allow classical films to cohere – within themselves as individual films and as a form – and constitute an absolute exception in the history of film, a cinematic invention without parallel. What Psycho demonstrates for my purposes, however, is neither the normalisation of desire (as according to psychoanalytic theory) nor the normality of representation (as according to cognitive theory), but the positive and specific power of indeterminacy which moving images can generate in our lives by violating the privacy of perception. The consequences of this demonstration imply, amongst other things, both the impossibility of cinematic identification – as conceived within the psychoanalytic tradition of film – and the impossibility of cognitive autonomy – as assumed within the supposedly counter-tradition of neo-formalism. Psycho has a very interesting construction and that game with the audience was fascinating. I was directing the viewers. You might say I was playing them, like an organ. The game that Hitchcock loved to set up was one played out at the limits of privacy. There is nothing original, once again, in locating this theme at the core of Psycho. From beginning to end, the film’s narrative never stops turning around the question of privacy, as critics have abundantly shown. As the action commences we find ourselves descending from the sky, sliding like snakes under the window of a motel room where an illicit couple struggle in secret over the idea of going public with their liaison. From then on, someone is always watching someone else. With every new development in the plot another invasion of privacy takes us deeper into zones of experience where the divisions between the private and the public begin to bend and blur or are deliberately transgressed: from the businessman’s unwanted solicitations; Marion’s initial act of theft; the mutual double-take when her boss recognises her in the escape car; the policeman who appears at her window, his face cut out of space, absolutely frontal, like a wall, a death mask, a living poster, a talking head on TV – taking to the limit the austere, TV-like shot/reverse shot claustrophobia of all her encounters; the hole in the wall through which Bates watches her; our own almost unprecedented observations of her movements in the bathroom; his murderous attack upon her in the shower. Bodies, faces, looks, cars, knives – all penetrate the zones of privacy and proxemic control Marion tries to establish around herself from moment to moment. And it doesn’t stop with her death. There is still the Private Eye whose whole business is to conspire against the rights of privacy; the psychoanalyst who makes it his job to expose the intangible secrets of the unconscious; the penultimate scene where we penetrate into the devastated interior of a man unable to experience privacy even within his own head, the voice of his dead mother impossibly intoning ‘they’re probably watching me now’; the final scene where the car containing Marion’s body is finally retrieved from the sludge and brought into the light of day. You know that the public always likes to be one jump ahead of the story; they like to feel they know what’s coming next. So you deliberately play upon this fact to control their thoughts. You turn the viewer in one direction and then in another; you keep him as far as possible from what’s actually going to happen. At the base of Hitchcock’s engagement with cinema, if we take him at his own word, was a fantasy of transparency and control through which the director would draw the pliant viewer towards himself, towards a position of unnatural intimacy, even as he simultaneously strove to minimise all contact with the viewer, to achieve a level of control through which the viewer would become an entirely redundant term in the process of realising the film. The viewer would ultimately become nothing more than raw matter which Hitchcock sculpted freely in time. Hence, the distinctive shape of Hitchcock’s other avowed directorial fantasy: to create a cinematic event – a crime or an accident – which the viewer would greet as coming purely ‘out of the blue’. In this perfect cinematic moment, anticipation and realisation would fuse: the index and the event, the smoke and the fire, would become synonymous. There would be no time to turn away, no time to act, yet there would be time to perceive and apprehend. Viewers would find themselves invaded by the terror of the image at the very moment they moved to anticipate it, at the very moment they formed the urge to respond and control the horizons of their own perception – whether literally, by covering their eyes, or simply by rationalising the context of their perceptions. Buttons would be pushed at the deepest possible level – right on the surface. 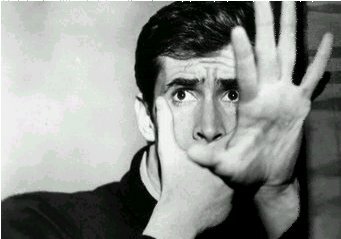 Where the fiction of Psycho explores the themes of voyeurism and privacy from being seen, Hitchcock’s explicit reflections on his own role as director address the quite different question of the privacy of seeing. For Hitchcock, deliberate violation of the privacy of seeing constituted the director’s ethical obligation, defined the very contract of perversity binding him to the mass of viewers he would never meet. There are two dimensions of privacy, then, just as there are two sides to the cinematic address: the side of the director, who works with cameras and cuts; and the side of the viewer, who expects only to be carried away in the flow. It is the singular way that Hitchcock makes these dimensions communicate – opens the one to the other through the precise effects of closure he exerts upon every frame – that must be articulated anew. I do not believe that we are in Plato’s cave. We are, for inestimable eternity, suspended between the body of a giant and the object of his regard. I am therefore not seated but suspended under a beam of light. This light is alive. It is a commonplace observation that Hitchcock often liked to launch scenes by framing a frame, more or less explicitly alluding to the proscenium arch of classical theatre. The effect is probably different each time and there is no reason to assume that Hitchcock’s penchant for reflexive framing is motivated by or converges upon any single signified. In this case, at the beginning of Psycho, an opening appears, a narrow slit beneath a window someone has left just open. We cross its limit and enter a new space. At one level, this is what happens all the time in classical cinema, as time and space unfold before us, around us, within us. The image moves of its own accord, and we go with it. We ‘find ourselves’ moving in and out of things, meeting and crossing limits. Sometimes the movement flows, following lines of least resistance in continuous paths through doorways and windows, across thresholds; sometimes it cuts as it pleases, defying the solidity of walls, transcending divisions, flashing in and out of a building, for example, to follow two parallel lines of action. Either way, the image never stops to ask me what I think before making its next move. All of that is just the ordinary stuff of cinema, but Hitchcock’s way of repeatedly staging a reference to the limit of the stage, only to immediately display his own ability to take us across its threshold, is fascinating because it seems to be repeated for its own sake. It’s not part of the action, rather a flourish of style, like a signature written out in the camera movements controlling our approach to the action. Something quite strange and important happens during this cinematic rite of passage, something uniquely Hitchcockian which nonetheless at once demonstrates and exploits the too-easily forgotten and domesticated strangeness of film in general. Entries and exits, the mundane matters of going in and out, are rarely innocent in the world of Hitchcock’s films (we will see later that Hitchcock made this explicit in the cardinal rule of editing he proposed to Truffaut). The camera’s movements across thresholds, in and out of enclosures, say something before the actors even open their mouths. The crucial thing about Psycho‘s fleeting cinematic reference to the space of theatre, it seems to me, is that no sooner is the arch framed by Hitchcock’s camera, than we immediately find ourselves moving through it. Movement takes us up and propels us through, across the limit of the intimated stage. It’s not just an act of referring, it is a physical event, a manipulation of the viewer’s perceptions. A manipulation which ultimately doesn’t depend on the making of any association, even if the reference does serve like a knowing blink, setting an extra hook for knowing viewers. The limit of the virtual stage is framed by Hitchcock’s camera only in order to be crossed, entered into. We are swept off our feet and carried across the threshold. It is not just that there is a frame within a frame, but that, put into motion, they deframe each other. The movement of the camera through the frame, a movement we can neither direct nor reverse, automatically deprives us of any measure of scale, of any hope for exactly that kind of human/natural regularity of proportions signified by the defining frame of classical theatre. In making this passage we are ushered across the threshold of another world, even as we remain exactly where we are, in the rather quotidian state of a bum on a seat; a purely cinematic world dominated by the absolute loss of all proportions, of any consistent scale of measure, in relation to our willingly useless natural bodies. The contrast suggested by the sometimes underlined reference to theatre is telling. The proscenium arch of classical theatre establishes a fixed frame against which the observed proportions of bodies-in-action vary continuously and predictably. As I watch a stage play, my gaze may carry my imagination across the limit and allow me to become absorbed in the drama and my powers of empathy may project me into the very bodies of the actors, but my perception will nonetheless always be determined by natural laws which dictate regular variation of proportion in relation to a fixed point of view. My own body is taken as a given, my inalienable possession of my own point of view is assumed, and it is on that basis that I relate to the bodies onstage. When Hitchcock’s camera flies through the arch, all this is left behind. Not just the space of theatre, but the laws of natural perception, too. In cinema, as in theatre, the spectator’s relation to the frame defining the spectacle may be constant and fixed, but the proportions of the actors in relation to that frame vary without any regular measure and the implied point of view from which they are observed shifts from moment to moment in a way that is, in principle, completely unpredictable and out of the spectator’s control. At any moment, for example, I may find myself thrown into impossibly intimate proximity with a face, enduring a situation more intimate than any natural interaction would allow, then hurled just as uncontrollably back into detached distance, or perhaps, instead, somehow find my world reversed, somehow find myself staring back at things from within the face I had just been staring into. Nothing tells me in advance where I will be, in relation to what, as a film unfolds. I can never determine the next thing I will see in relation to my current point of view on the action. The decision is literally out of my hands. Worse than that – but also better than that – I cannot know with any surety from whose or what point of view I monitor the action as it unfolds. I am, in effect, no longer in command of my own perception, which has been cut off from the possibility of any effective reaction and is no longer conditioned by the context of my intentions and responses, no longer regulated by the continuous self-possession of my own point of view as my body interacts with the world. Cinema is above all a controlled crisis of proxemics. All of this is effectively demonstrated by Hitchcock in the apparently simple, repeated act of framing a frame and passing through it. This gesture calls attention to itself, but not at all, I think, in the way that a certain kind of film theory has often assumed that such a gesture should be understood. It is neither a matter of exploiting the fundamentally voyeuristic nature of the spectator’s identification with the camera as it effortlessly penetrates and dominates space, nor a purely negative gesture aimed at exposing the mechanisms of that identification. Nor, even, both at once. Something altogether different is at stake, even if it sometimes includes an appeal to voyeurism as one of its elements. The dominant note when Hitch plays his viewers is neither that of subjective mastery, nor of its exposure as merely imaginary. Our manipulated passage back and forth across the threshold between two worlds, a passage which is going all the time, from moment to moment, frame to frame, whenever the action rolls, signs itself here as an invocation of fate and the demonstration of its irreversibility – the fate of the characters, to be sure, but even more so, the fate of the viewer, the fate of my affect, which is intensified, not diminished or held at a critical distance, by the very conspicuous and idiosyncratic way Hitchcock’s camera calls attention to itself. In Hitchcock, cinema asserts itself as aberration of movement and dispossession of point of view. What is at stake here is a positive and specific experience of indeterminacy: of not knowing what is coming and where I will stand in relation to it. Control and indeterminacy are not opposed. Suspense, of which Hitchcock remains the acknowledged master, is merely the form of cinema that focuses most self-consciously on this general truth of cinematic experience. The only thing of which I can be sure, from moment to moment, is that whatever I see will not arise from the continuity of my own actions and reactions. Whatever I see, I will not have chosen. I will never be able to react upon the content of my perception or interfere with the process of its unfolding, but I will have seen it, I will have felt it, my memory will have responded to it. That will have been my fate. It will all have nothing to do with me until the moment it strikes my eyes and ears, yet it will only come to pass if I allow it to eventuate within me. Momentarily, yet lastingly, as memory. In public, yet incommunicably. In this sense, what promises to reveal itself to me, from moment to moment, in what Schefer calls the ‘experimental chamber of cinema’, is much more than an observable world where bodies appear to act of their own accord; it is the fate of my affect, the shape of a feeling that will live in me, become part of my life. And I am always too late to do anything about it. Suspense plays on the helplessness of my point of view: I am being rushed towards thoughts that are not my own. At the narrative level in suspense I am too early – I must wait to see what happens – but in terms of the privacy of my perception I am too late from moment to moment. I can do no better than meet the fate of my affect. (This is precisely why I do and don’t want to see what comes next at the same time; why I cover my eyes but keep staring through the cracks, start climbing over the back of the chair as if to be shielded, but never turn my back on the screen). The organ the director plays upon is the organ of my lateness. Cinema is an art in which my lateness feeds back on itself. It is this sense that I believe one must understand the ‘paradox of suspense’ which Noël Carroll formulates, but attempts to resolve in sterile cognitive terms. A suspenseful sequence can remain suspenseful even when I have seen it before, even if I know all too well what is about to happen and when. Suspense may even be enhanced in such circumstances. What remains indeterminate even when the narrative outcome is certain, what may have changed in the interim since my first viewing and which may now be ready to reveal hitherto unknown dimensions, is not something in the film itself considered as an object kept at a distance, it is the film in me, as it lives in me. Ultimately, it is myself. What I really hope/fear may emerge, at any instant whatever, is an image of my own secret body, an image of my fate, the body that is seen by time but does not appear in space: the virtual body which expresses me as pure possibility. Watching a Hitchcock film we are manipulated in a way that brings us to the threshold of an experience that cannot be manipulated, neither by director nor by viewer, a moment of ‘real’ affective risk (though it may be retrospectively rationalised, this does not cancel affect as memory). Thus the suspense in Hitchcock turns not only on the violent moment of convergence between opposed forces (already mastered by Griffith), but on the possibility that this will also function as a moment of reversal in which all of the characters change their relation to each other – and therefore force us to reconsider our relation to ourselves. The question which plagues me as I put myself in Hitchcock’s hands is finally not just ‘what will happen next?’, but ‘what will I have become?’. Welcome to Issue 5 of our monthly, ever-burgeoning journal! Bill Schaffer teaches Film Studies at the University of Newcastle, Australia.